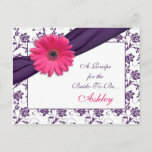 Pretty and cheerful violet purple and white floral damask hot pink gerbera daisy bridal shower invitation. You can easily change the text on the Zazzle website. You can also enclose the matching gerber daisy recipe cards inside the invitation and have your guests fill out the cards with their favorite recipes as a gift for the bride to be. A fun activity for a recipe themed bridal shower.